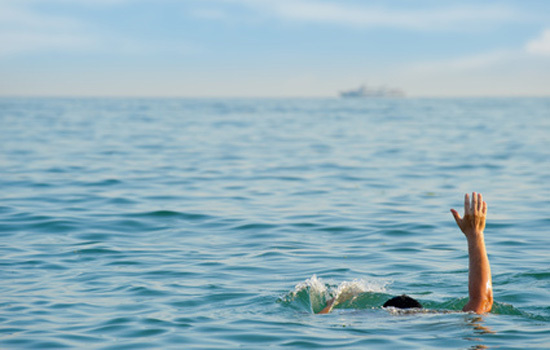 But there's more to financial literacy than just saving, spending, and earning. 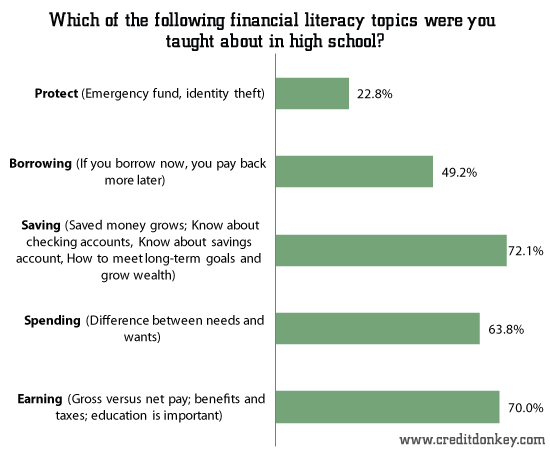 The Jump$tart Coalition defines financial literacy as “the ability to use knowledge and skills to manage one's financial resources effectively for lifetime financial security.” However, the majority of respondents to the CreditDonkey.com survey did not learn about borrowing or protecting their finances during their formative years. Indeed, these items were last on the list even though they’re just as important in today's uncertain economic times of little savings and high unemployment. In our survey, only 22.8% of our respondents were taught about protecting themselves from identity theft or saving cash for an emergency, such as a sudden medical issue, job loss, or car repair. If those issues are not taught in high school, people will have to learn them the hard way, at the moment, leaving families at risk for financial destruction. These young adults are then left to make uneducated choices when they are on their own, and often that plays out in ballooning credit card bills. A 2009 Sallie Mae report found undergraduates are carrying record-high credit card balances. Sixty percent of undergrads experienced surprise at how high their balance had reached, and 40% said they have charged items knowing they didn’t have the money to pay the bill. Just less than half, 49.2% of our survey respondents, said they have been taught the basics of borrowing in high school. Unless their parents stepped in or they found out some other way, the other half missed out on the critical lesson that when you borrow money, you have to pay back more than the original amount and that you have to be able to earn enough money for basic living expenses plus enough to pay back the debt. Again, that lesson is being left to learn the hard way, again leaving families at risk and shrinking future earning power as so much of it is earmarked for debt. Share on Facebook "Survey: Financial Literacy Statistics"